Recently, we came to you with 35 inventions that changed the world. Well, we’re back with those inventions that no one actually intended to invent. From everyday objects like corn flakes to microwaves, these accomplishments of scientific twists of fate have impacted human life. Millions of people pop open a box of corn flakes each morning, but the popular cereal almost never happened. 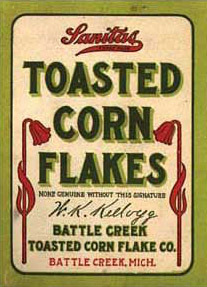 W. K. Kellogg along with his brother Dr. John Harvey Kellogg developed the first edible corn flake product accidentally. During 1898, while conducting a research about the patient's diet at the Battle Creek Sanitarium in Michigan, W.K. Kellogg, and his brother Dr. John Harvey Kellogg, accidentally flaked wheat berry. W.K. kept experimenting until he flaked corn, and created the appetizing recipe for Corn Flakes. At first, the cereals were ready to be eaten without the addition of sugar or milk. However, W. K. Kellogg noticed the potential benefits of combining the cereal with milk. He was also a pioneer in the mass marketing of the product to the public. In the 1900s, to help consumers distinguish from 42 other companies, W.K. signed on each package, saying that these Corn Flakes were the "The Original." Now, that accidental breakfast food has been transformed into different flavor varieties and consumed by millions each year. For decades, Super Glue repaired any and all broken items around the house. In fact, creator Harry Coover didn't realize its potential when he discovered it. Like many of us, he thought it was too sticky. In 1942, Coover was working for Tennessee Eastman Company when an accident resulted in the creation of cyanoacrylate known as Super glue when he was experimenting with acrylates. Actually, he was attempting to make scrupulous gunsights to be used during World War II. It took almost a decade for Coover to understand the product's significance. In 1951, Dr. Coover and fellow researcher Fred Joyner were testing hundreds of compounds and thus spread the 910th compound between two lenses. To Joyner’s dismay, the lenses were not detachable. After seven years, super glue was ready for commercial use through Eastman 910 company. Though super glue wasn't patented by him, Dr. Coover held 460 other patents. Of all the ultra-modern kitchen appliances, the microwave oven is a notable invention. After all, it makes cooking a nighttime snack quite easy. But how many know it was accidently invented? The inventor Percy Spencer was an engineer at Raytheon. In 1945, he noticed that a candy bar in his pocket started to melt while he was working with magnetrons. Later Spencer patented the invention along with his employer. it was called "RadaRange" and launched it for commercial use after two years. Percy Spencer was inducted into the National Inventors Hall of Fame of 1999. Do you know that a wrong resistor helped in the invention of the pacemaker? While working as an assistant professor in electrical engineering at the University of Buffalo, Wilson Greatbatch designed the first practical implantable pacemaker. When he was working on building a heart rhythm recording device, he completed the circuit with a wrong sized resistor. This new circuit emitted intermittent electrical pulses. On May 7, 1958, Veterans Administration hospital doctors demonstrated that this two cubic inch device could take control of a dog’s heartbeat. Greatbatch patented more than 325 inventions, among which a long-life lithium battery is notable. No accidental invention list is complete without a mention about Penicillin, aided in the development of modern medicine. A Scottish bacteriologist at St. Mary’s Hospital, Sir Alexander Fleming introduced penicillin that cures bacterial infections. As the story goes, after returning from a summer vacation on September 3, 1928, Dr. Fleming noticed that a mold called "Penicillium notatum" had contaminated his Petri dishes and prevented the normal growth of the staphylococci. In March 1942, Anne Miller became the first civilian patient to be successfully treated with penicillin 14 years after the invention. Alfred Nobel, a Swedish chemist, and engineer devoted his time and life to the study of explosives. In efforts to stabilize nitroglycerin, a highly unstable and explosive liquid, Nobel and laboratory workers experienced several accidents, one of which resulted in an explosion leaving Nobel's brother Emil dead in 1864. This might have pushed him to find a solution to safely store explosive materials. As a result of an accident, he discovered a safer way to store nitroglycerin. During an experiment, a can with nitroglycerin broke open and leaked, but the liquid was absorbed by a rock mixture called kieselguhr. He patented his product in 1867, calling it dynamite. Dynamite was soon used in blasting tunnels, cutting canals, building railways and roads and also during war time. To establish peace in the world, in November 1895, Nobel signed his will for the establishment of the Nobel Prizes. Of course, x-rays are a phenomenon of the natural world, and thus can't be invented. However, they were accidentally discovered . The invisible was made visible in 1895. X-ray is undoubtedly one of the epoch-making advancement in the field of medicine. All credits to physicist Wilhelm Conrad Rontgen. While testing whether cathode rays could pass through glass, he noticed a glow coming from a nearby chemically coated screen. Because of their unknown nature, he named it X-rays. Through his observation, he learned that X-rays can be photographed when they penetrate into human flesh. In 1897, during the Balkan war, X-rays were first used to find bullets and broken bones inside patients. In 1901, he received Nobel prize in physics for his work. It all started at Chemours Jackson Laboratory in New Jersey on April 6, 1938. Chemist Roy J. Plunkett was working with gasses related to Freon refrigerants. Upon checking a frozen canister, he and his associates discovered that the sample had polymerized spontaneously into a white, waxy solid to form polytetrafluoroethylene (PTFE). Intrigued by the mysterious chemical bits, Plunkett began to experiment with their properties. In 1945, Chemours company registered it with a trademark Teflon. The new substance proved to be significant in areas such as aerospace, communications, electronics, industrial processes. Now, Teflon is prominent in non-stick cookware, soil and stain repellant for fabrics and textile products. PTFE revolutionized the plastic industry along with limitless benefits to mankind. Plunkett was recognized for marvelous inventions and was inducted into the Plastics Hall of Fame in 1973, and, in 1985, into the National Inventors' Hall of Fame. From storage of medicine to shelter and transportation, plastic is responsible for countless aspects of the modern life. Plastics are unified into the day to day life and make an irreplaceable contribution to the present day world. But the world’s first thermosetting plastic was discovered accidentally. Through the invention of Bakelite, the inventor Leo Hendrik Baekeland helped in the establishment of modern plastic industry. Bakelite was discovered in 1905, while searching for a synthetic substitute for shellac. Baekeland was honored for his invention and served as president of the American Chemical Society in 1924. Bakelite can be molded quickly, less expensive and retained its shape even when heated. It's a star among manufacturers, jewelers, industrial designers, electrical and automobile industries. In 1923, Epperson finally filed the patent for his invention with the latter name Popsicle. A couple of years later, Epperson sold the rights to the Joe Lowe Company in New York, under the brand name Popsicle. As soon as it hit the market, it was a huge success. It is estimated that in the 1920s, around 8,00 popsicles were sold in a single day Brooklyn’s Coney Island amusement park. The first Popsicle was sold for just five cents and came in seven different flavors. Popsicle has different names in different locations. In the USA it's popsicle, but in England, it’s an ice lolly. In New Zealand, they are icy poles and the Irish call them freeze pops.